VSO volunteers in Mornington, Co. Meath, on AFrI’s Great ‘Famine’ Project. Amongst those attending was Tom Hyland, a CIE bus driver from Ballyfermot, Dublin. Hyland was very taken by Don’s talk and asked if he could travel back with him to Dublin as he wished to continue a conversation Tom initiated at the end of Mullan’s presentation. At the conclusion of their journey Don invited Tom to visit the AFrI office in Harold’s Cross the following Monday where he introduced Tom to his colleague, Joe Murray. It was to be the beginning of an enduring friendship between both men. In 1993 Tom, by chance, saw a John Pilger documentary, “Death of a Nation: The Timor Conspiracy.”  The documentary graphically exposed the brutality of the Indonesian occupation of the small island and the massacre of some 200,000 Timorese people. Tom was so incensed by the documentary that he began the East Timor Solidarity Campaign, with the enthusiastic support of AFrI. Don Mullan was interviewed, amongst others, in Tom’s Ballyfermot home by RTE journalist, Joe Duffy, then working on the Gay Byrne Radio Show, at the launch of the campaign. 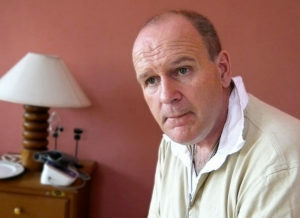 Tom excelled in the role and skilfully built the campaign into a major national human rights campaign and one that would later be recognised as amongst the most effective internationally by the new East Timor Government, following their independence from Indonesia. In the immediate aftermath of the 30 August 1999 UN backed referendum, in which 78.5% of the population voted for independence, pro-Indonesian Islamic paramilitaries began to attack East Timorese pro-independence groups, including the Catholic diocese of Dili, whose Bishop, Carlos Filipe Belo, had won the 1996 Nobel Peace Prize along with political activist, José Ramos-Horta. Terrorised, tens of thousands of East Timorese fled to the mountains, while a tense stand-off ensued around a UN compound, within which civilians sought protection. At the height of the crisis, Mullan travelled at the request of Tom Hyland to Washington DC to meet with bi-partisan Congressional committees, the State Department and representatives of the Clinton Administration, to ensure US pressure was brought to bear on the Indonesian Government to respect the results of the referendum and to end of violence against the Timorese people. 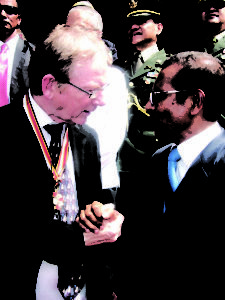 AFrI’s role in supporting the East Timor Ireland Solidarity Campaign was recognised when Joe Murray was given the honour of accepting on behalf of the Campaign, the Timor-Leste Presidential Medal, in recognition of its role in supporting the Timorese peoples struggle for independence.